The Holy Land Medical Project is a partnership of Saving Lives, a Rotarian Medical Aid Agency, and the Universal Peace Federation’s Middle East Peace Initiative. It is following a successful model of collaborative health care in parts of India that assisted reconciliation between two communities in conflict. We will establish a Board of Trustees of the three faith leaders, Israeli and Palestinian Doctors and business managers from both communities to oversee proposed training health centres. With support from the Saving Lives network, UK volunteer Doctors and the international network of Ambassadors for Peace, it is planned to provide medical training courses, telemedicine, exchange visits, and twinning of hospitals. There will be a visit in early December to assess the needs of various hospitals and draw up a business plan. 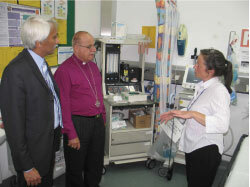 In December two senior Doctors from Birmingham Children’s Hospital will visit Caritas Baby Hospital in Bethlehem. There will be a three year commitment to establish a self-sustaining project. Bishop Riah Abu El-Assal, a Founding Patron of the Holy Land Medical project, Ingrid Stellmacher, Head of Policy for Conflict Resolution with Human City Institute (HCI), and Robin Marsh, of the Universal Peace Federation’s Middle East Peace Initiative (MEPI), visited Birmingham on the 11th and 12th of September at the invitation of Dr Peter Patel, the Chair of Saving Lives. We compared the situation of Caritas Bethlehem Baby Hospital and Birmingham Children’s Hospital and Bishop Riah explained the general state of medical care and health of the Palestinian population in the West Bank. We touched on the possibility of twinning and exchanging of expertise. If you would like to help this project please contact me at the contacts below.